Lovers of land art will be pleased to see earthworks celebrated in a somewhat unexpected location: on the grounds of a synchrotron radiation laboratory. 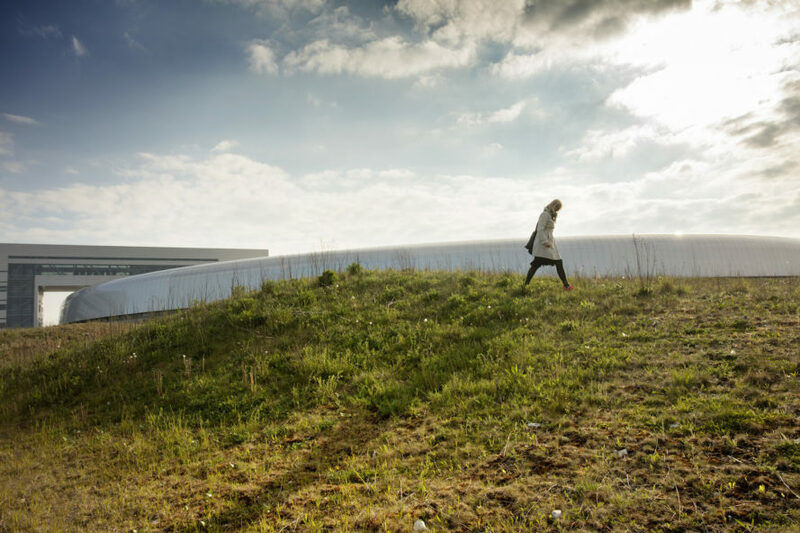 Snøhetta’s landscape architecture team designed a sculptural and functional landscape for the MAX IV Laboratory, which recently opened this summer just outside Lund, Sweden. Nearly 50 acres of formerly agricultural land were sculpted into land art with a focus on functionality and sustainability. 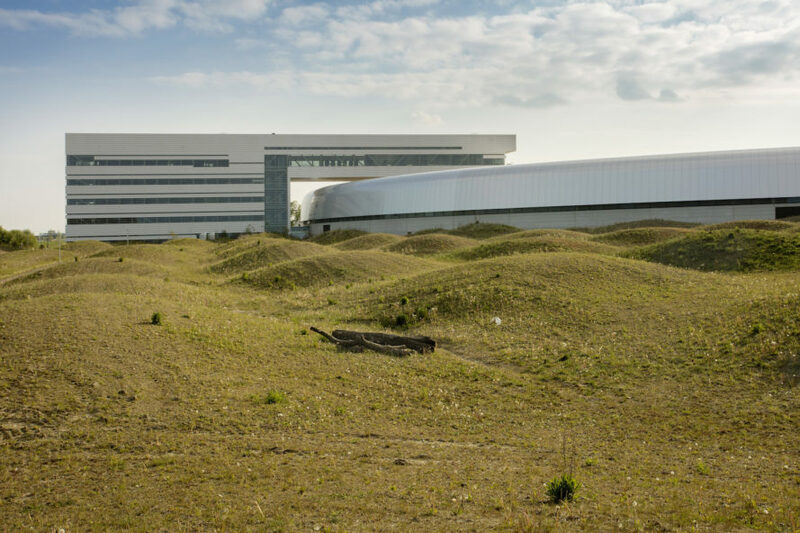 Undulating grassy swells reminiscent of ocean waves dominate the MAX IV Laboratory landscape and are placed in an arc formation radiating out of the circular, Fojab-designed synchrotron facility. Inspired by the rural landscape and perhaps radiation waves, the sinuous landscape is more than just eye candy. The landscape architects used computer models to design a wave landscape that mitigated ground vibrations, optimized cut and fill strategies, and used the valleys of the mounds to manage stormwater onsite, with help from a dry and wet pond. Maintenance is minimized thanks to the use of local native meadow grasses, which can be trimmed with grazing sheep. MAX IV is a national laboratory that officially opened on June 21, 2016. The lab is the first phase of a development project that aims to turn the rural lands northeast of Lund into a “Science City”. 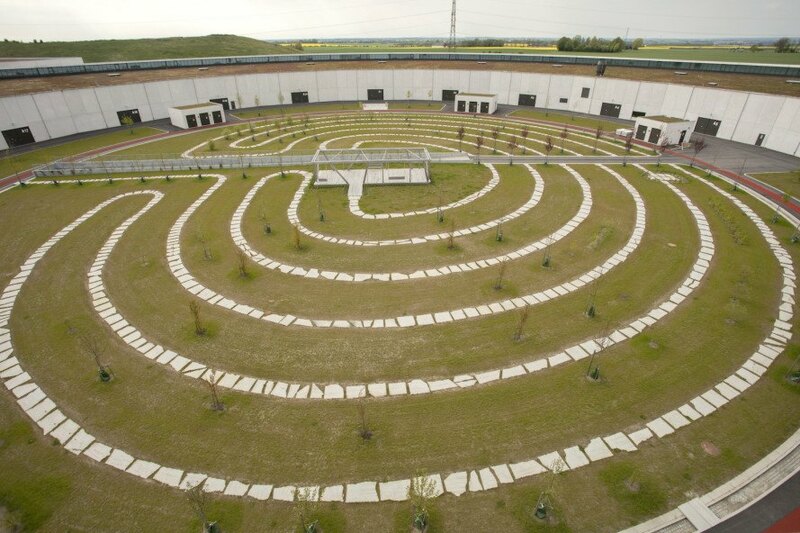 Undulating grassy swells reminiscent of ocean waves dominate the MAX IV Laboratory landscape and are placed in an arc formation radiating out of the circular, Fojab-designed synchrotron facility. The landscape architects used computer models to design a wave landscape that mitigated ground vibrations, optimized cut and fill strategies, and used the valleys of the mounds to manage stormwater onsite, with help from a dry and wet pond. Maintenance is minimized thanks to the use of local native meadow grasses, which can be trimmed with grazing sheep. MAX IV is a national laboratory that officially opened on June 21, 2016. The lab is the first phase of a development project that aims to turn the rural lands northeast of Lund into a “Science City”.